When viewing the Ultimate Edition, you get a fleshed out version of the long-term plan Lex Luthor set in motion to discredit Superman, and attempt to convince the head of the Congressional committee on Superman to let him import Kryptonite for weaponizing. At the same time he is acquiring the weapon, he is manipulating resentment and misunderstanding between the titular heroes, arranging for Superman's death at the hands of Batman. DC comic fans are more than familiar with the two characters coming to some sort of blows. 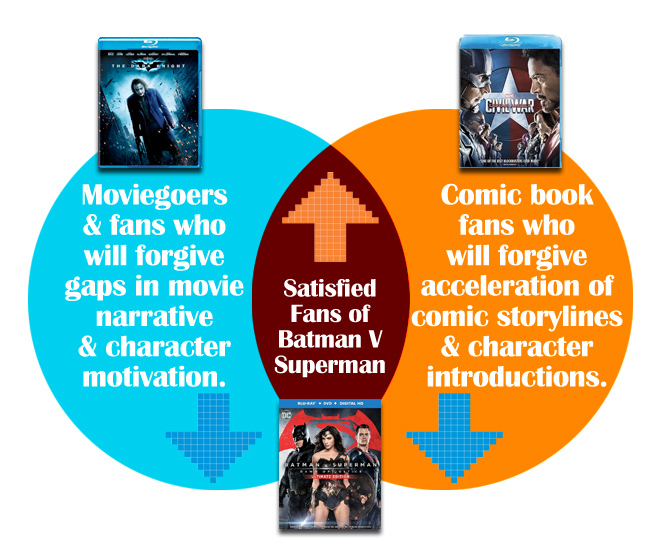 Audiences whose primary experience is the previous WB super hero adaptations find the two characters fighting much harder to conceive, requiring a lot of explanation. Yet, to movie fans unfamiliar with either history, it's entirely up to this movie to justify the conflict with the character arcs as they have been portrayed here alone—something the movie actually accomplishes for its own cinematic versions of its titular characters. But, frankly, I'd surmise hardly any audience members for this movie are totally unfamiliar with previous incarnations of the characters. It's at this point that high-brow movie interests and comic book interest collide, in that we are dealing with the versions of the characters as they are in the cinema reality: a new and inexperienced Superman unsure if and how to be a hero, and a grizzled and angered Batman with P.T.S.D. and way too many grudges and demons. These characters have decades of (oft-rebooted) relationship behind them in comics. Despite the scoffing of fans seemingly only familiar with previous DC cinematic incarnations, there's plenty of precedent, beyond Frank Miller, in Batman and Superman in open conflict in this storied history. The movie does such a slow, careful job (in the Ultimate Edition) of laying out the how and why of their conflict... even if it does amount to a lot of intentionally manipulated misunderstanding. With highbrow Dark Knight influence and stomp-romp Marvel envy goals competing, neither influence wins precedence over the resultant goal of the movie. Yet as the movie proceeds in the second act and into the third, slow and careful establishment ofhow and why (for Bruce Wayne and Clark Kent, if not Lex Luthor or Diana Prince) starts to speed up drastically. The execution of key moments of concern and conflict become rushed to make way for the introduction of the "Meta-Human Thesis," Wonder Woman, and Doomsday. The first half of the movie attempts to please cinema fans taken with the The Dark Knight Trilogy by weaving a believable, real-world drama from a fiendish plan, the second half drops inexplicable gods and monsters in to alternately threaten and save the day with seemingly no plan. The second half of the movie begins to bust out big, time-honored DC action scenes and scenarios, in clear service to the comic book fans. But for many DC fans, these long-anticipated film enactments are too fast, too many, not given proper time to unfurl and be expressed faithfully. We knew it when we saw the second trailer, the one that spoiled Doomsday's reveal. I won't even go into the hubris of the marketing had to have to spoil what could have been the best thing about adding him to the movie: the surprise of his reveal. It seems they replaced the potential word-of-mouth of his presence with a record marketing spend. His premature reveal gave fans time to consider the Doomsday story arc, how much it involved including the arc of the Death of Superman, and how well it would fit in a story already aspiring to capture the story beats of The Dark Knight Returns. The fight in the original The Dark Knight Returns was depicted as the culmination of years of disagreement between the anarchic vigilante and the Boy Scout sellout. This acceleration effect exacerbates as the third act proceeds. By the conclusion of the act and the frantic final fight with Doomsday (a scene that may have been the highlight of the film for movie-goers not steeped in DC lore) comic fans have seen whole story arcs: like the discovery by Superman of the existence of Kryptonite, the titular fight, the reconciliation, the rescue of Martha, the birth of Doomsday, the debut of Wonder Woman and her introduction to the other two, the nuking of Superman by the U.S. government (from the Frank Miller inspiration), the healing of said nuked Superman in the light of the sun, one more Lois rescue, the Death of Superman, and, as if in a final Coup de gras of excess, the first hints at the Return of Superman. Zack Snyder's fantastic visual work in all these scenes gives DC fans amazing fight scenes, as well as brief and powerful compositions that evoke the comic book panels of the powerful character arcs as they become encapsulated as individual story beats in one apocalyptic Batman/Superman blowout. The wedging of so many arcs-as-beats in the movie's back end has ripple effects forward into the movie, hurrying the movie through or entirely past key concerns of DC fans in the fight between Batman and Superman that served, at first, as the core draw of this movie. The script rushes through and past any sort of concern about the characters learning each other's secret identities. Clark Kent the reporter, very much concerned with the activities of the Batman, learns at the aforementioned dinner party that the Batman is, in fact, Bruce Wayne... and never says or does anything with the information. Bruce in this story, to be fair, is unaware of Superman's knowledge (and I give full props to Ben Affleck's impressed smirk when Superman refers to him by name when their fight scene starts), and doesn't seem to give a crap who Superman is IRL... but seems to recognize him mid-conversation. Later, it's revealed that Lex knew everyone's real identity, and the party scene itself become an almost farcical deconstruction of the usefulness of everyone's "day face," except, of course, for the incredibly eye-catching woman in the red dress. I'm a fan of animated Batman. Animated Batman made sure to even the score. In a way, Batman V Superman was never going to be able to escape some of these criticisms, in that its very plot is about accelerating the meeting between these two characters in conflict. But it is a built-in concerns of DC fans in seeing this material executed. However, it's one thing for me, as a non-objective DC fan, to wish for arcs that were never addressed. It's another when the speed with which these heroes attack each other with deadly force arrests all the movie's viewers. The artificial acceleration of their meeting, from a few terse words into deadly combat, is very jarring. This is really a shame because, as I pointed out in my previous DCEU article, the timing and execution of the final execution scene of Zod in Man of Steel was so carefully laid out to justify Superman's violence. In Batman V. Superman, however, despite a great deal of lead up and justification as set up by Luthor's manipulations, the key timing of the first conflict between the titular characters is rushed. Superman's response to Batman's "greeting" is too aggressive, too fast, by just a few moments, or words of dialogue. If Batman gets all up in Superman's face, and his suit is instead made of hockey pads, is he going to shove Bruce's ribcage 300 yards behind him and then feel bad? When Superman growls in frustration, "there's no time!" we don't believe him, and in fact the author's voice intrudes into the narrative through Superman's words at that moment. Armchiar scriptwriter insists another appropriate mechanism could have been in play, instead. Bruce could have shut down his ability to hear outside noise when he activated his sonic weapon, literally as well as figuratively blocking out what Supes has to say, only getting his audio back later when Superman ripped away part of his cowl. That's my device, to fix the problem, but in truth Superman has little to say in the movie overall, as pointed out in a Screencrush article by Charles Bramesco, summarizing a reddit post pointing out that Superman Only Has 43 Lines of Dialogue in Batman vs. Superman. Despite the accelerating factor of Luthor holding Martha Kent hostage with a time limit for her death, Superman doesn't spend enough time trying to talk to Bruce, to explain that he's aware that their resentment of each other has been manipulated. Apparently, there's no time. Once the Kryptonite comes out all bets are off, and Superman—no doubt shocked as I was to be in a universe where Batman is the first character to use it on him—is fighting for his life, and I wouldn't change a thing. The Batman and Superman fight, once it's begun, is beautiful, luxurious, and as a DC fan I felt a palpable delight to have navigated the gappy rapids to the payoff I had been hoping for. It can be stated enough there where it really, really counted, Zack Snyder didn't let me down. But as the fight came to its conclusion, I was beset with another moment that worked for me and was holding me deep in its grip, when Snorty Dude next to me clued me in to the fact it didn't work for everyone. I had responded so strongly to the plot elements establishing Bruce's P.T.S.D. And somehow, in all my years of DC fandom, I had never actively considered or brought to the front of my mind the fact that Batman and Superman's mothers had the same first name: Martha. When the utterance of the name was the break point in the conflict, even as I lamented how Lois ran up just then to essentially finish Superman's sentence for him, it worked for me. I watched Ben Affleck's performance transfixed, as Batman realized and broke out of his trance-like obsession and threw away his weapon, and I heard the snickers from the audience including Snorty Dude, who didn't have the same response. I think it could have worked for most audiences, if it had not borne the weight of the entirereversal of Bruce's course of action on its own. Once again, just a bit more time or an alteration of the timing: Superman uses his words and explains that Lex has his mother hostage and has set this all up, before Bruce throws away the spear. Martha as the interrupt, but manipulation as the reason Batman won't follow thorough. Some further dialogue from Superman, just a little bit, detailing all the steps Lex had taken would have further cemented the Batman's change motion into his next course of action: saving Martha, one of the best sequences in the film. If the primary criticism of this scene was the suddenness of the characters' change of heart, the solution would have been more time invested in the scene. In the theatrical cut, the fights survive beautifully, luxuriously intact, but all the moments of character decision and change are rushed. Before rescuing Martha, only in the Ultimate Edition do we get to see Batman redeemed with Alfred by apologizing and stating he doesn't deserve him, to which Alfred wholeheartedly agrees. After that regardless of edition comes Doomsday, Luthor's mad-scientist backup plan—in truth initiated before he's barely begun his primary one—involving reviving and mutating Zod's body into an ancient Kryptonian deformity. Luthor's increasingly irrational actions after being denied his import license for the Kryptonite are artificially accelerated to establish the later debut of Doomsday. And the acceleration of Doomsday is all about the acceleration of the introduction of proper Wonder Woman (since she hasn't been provided another reason to be there other than the lure of a good,necessary fight), and thus the uniting of the classic DC Trinity to face the threat Doomsday represents. Why blow up Congress with a wheelchair made out of your unique special metal "implicatium," if you just smuggled in the Kryptonite anyway? Wouldn't it have made more sense if the bombing led to him not only receiving the import license from the Senator's treacherous lackey, once it makes sense that the surviving senators would happily grant him carte blanche access to the spacecraft and Zod's body in fearful response... instead of surreptitiously, implausibly? Why unleash Doomsday if you don't know yet if Batman has killed Superman? 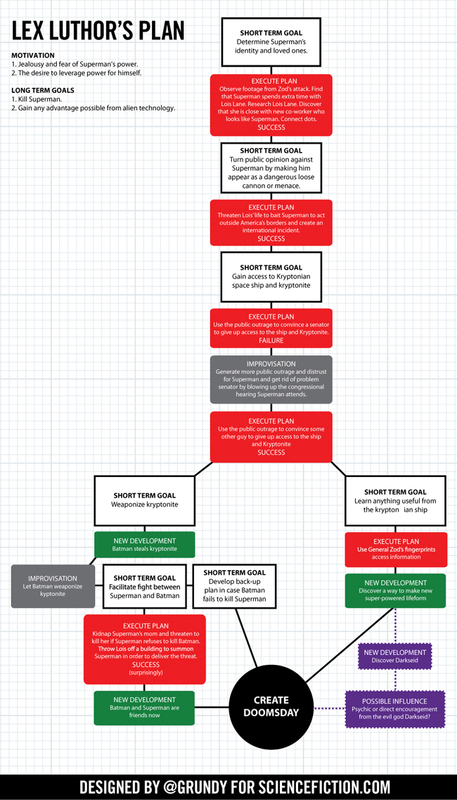 Why even start that part of the plan until you have monitored and realized it's time for the "hail mary?" Won't Doomsday just pretty much destroy everything? How is that winning, if your goal was to kill godlike things? Spawning Doomsday to kill Superman is such a personal act of vengeance. There's no reason for it until Lex has experienced defeat at the hands of Superman. Sure, he gets to gloat about Doomsday after Superman reveals he is not dead, apparently to Luthor's surprise. But if Luthor had not been surprised, Doomsday would have been born and just smashed Luthor, "mad scientist" enough to hang out in the downed Kryptonian ship long enough for Doomsday's chrysalis to mature (or influenced by a scene detailing his contacting another alien influence, present only in the Ultimate Edition). The flowhcart lies: Lex gets access to the Kryptonian ship before the bombing. He then skedaddles back to it to birth Doomsday with no idea how his Fight Night is going. Wonder Woman stays focused on retrieving her file, with Bruce's help. And thanks to the "Meta-Human Thesis" we are treated to an awkward scene of her viewing an introductory movie file of all the future Justice League members, instead of showing any interest or interaction at all with Superman, who doesn't even seem to get his own file! Without an MPG of his own, Superman apparently doesn't draw Wonder Woman's interest or present a threat, and so we are treated to scenes of her heading out of town on the latest flight with complete disinterest in the fates of Batman and Superman—or even the growing disturbance at the Kryptonian ship—until Doomsday presents himself as a worthy opponent. Although the change of heart is consistent with the character of an immortal Amazon warrior who loves a good fight, the movie would undoubtedly told a better beginning-to-end story arc involving her character if the audience knew that she arrived at the story with goal in mind, evaluating and rejecting the threat of Superman. The final fight with Doomsday is, as mentioned before, probably one of the comic arcs subject to the most artificial acceleration of all. It comes as the concluding conflict in a third act replete with combat, and so faces the issue of outstaying its welcome should it stretch on too long (particularly for general audiences). 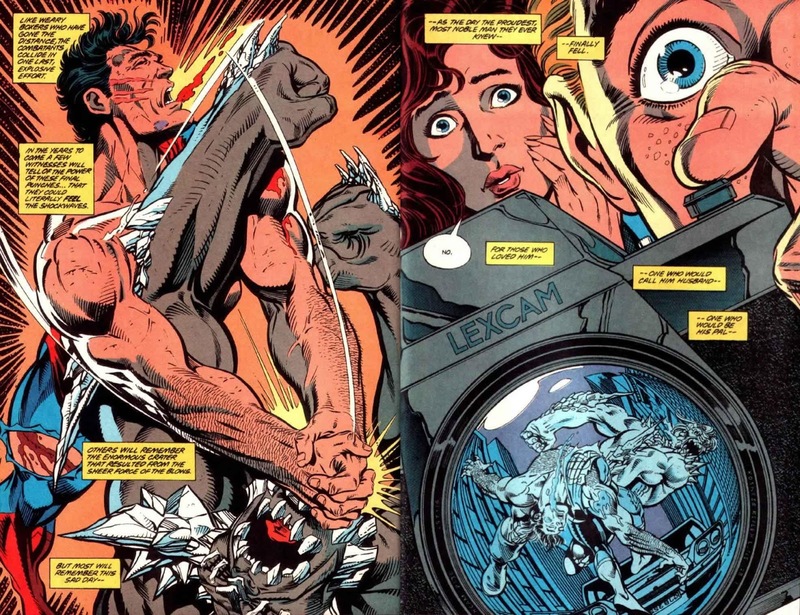 Simultaneously the sequence as conceived as the film's "capper" is doomed to short-shrift long-standing DC and Superman fans hoping one day for a cinematic treatment of the epic comic story arc. Some fans took issue with the design of Doomsday, toning down the bone ridges and the hair from the comic design (which is something the character developed in the comic arc aftermutating in response to plenty of combat). Some fans took issue with the origin of the character, a genetic deformity Luthor spawned using the genesis chamber on the Kryptonian wreck merging his own DNA with that of the corpse of General Zod. I didn't share either of these complaints, in fact I felt the appearance and introduction of the character was a great innovation, once again applying in-movie logic to weave believable, traceable beginning-to-end story arcs for its characters. I thought it was a strong enough of a premise to carry it's own movie, if Lex's "Doomsday option" had been launched later in Batman V Superman, as a desperate revenge play when knows he is beaten. The unfortunate thing, for a DC comics fan, about Doomsday in Batman V Superman: Dawn of Justice is that they altered the already imposing monster to show him appear to detonate in periodic energy blasts when attacked. If there is no clearer sign that the production team had some amount of self-awareness about the length and compactness of the final third of the film it is this revision to the character of Doomsday: transforming him into an actual bomb. This straight-up prevented a telling of the comic battle, a long and brutal fight where Superman gave his all with his final ounce of strength. I won't tell you that I thought the Doomsday arc and the Death of Superman was a triumph in comic storytelling. But it stretched across hundreds of miles of real estate, involved and challenged nearly every member of the Justice League, and gave Superman dozens of opportunities to take it in the chin by rescuing both civilians and his teammates before the final battle, really proving himself as a hero to be mourned before his heroic death. That's what made it good to the readers. It had almost nothing at all to do with Doomsday, who appeared without origin as just some sort of unreasoning and marauding force, a match of strength for Superman along, and perhaps even more than a match for him. It was a story about Superman, and what he would do to protect people. Rushing this arc, setting the battle in a lifeless area with no one to threaten or save, didn't give Superman the time to shine as a hero up against Doomsday the way the comic arc did. He smartly takes Doomsday into space, before artificial acceleration of nuclear proportions overtakes him. He returns to the fight briefly, in time to hear Lois trapped beneath the rubble and bail mid-fight on his allies to rescue her and accidentally retrieve the Kryptonite weapon. It comes across as haphazard, slipshod, rushed... and as a result Superman's final act of self-sacrifice has a lesser effect. The movie's haste hurt the hero of Superman the most, without question. 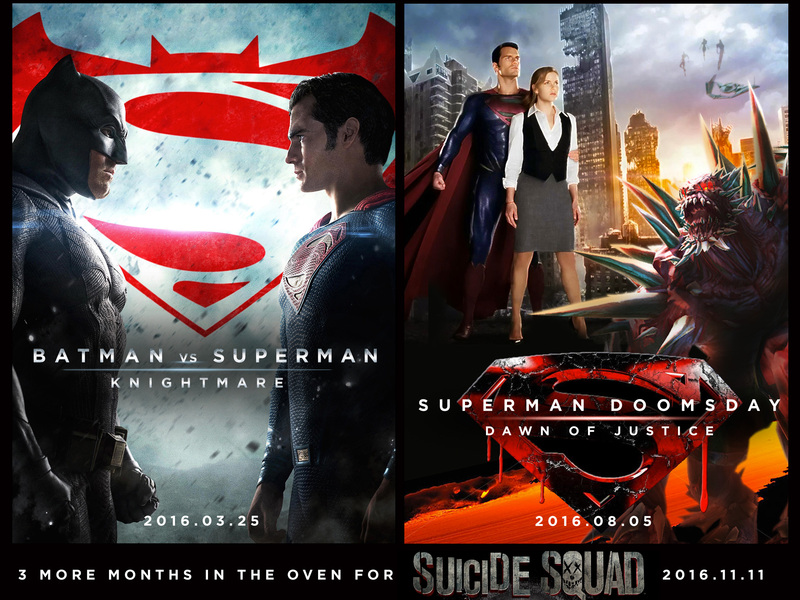 A better DCEU 2016 from an alternate universe. Maybe if Luthor were more "Zuckerberg-like," people wouldn't have freaked out that he made little logos for the Meta-Humans. They're cover images! Any self-respecting Lex Luthor would have kept a chunk of that rock for backup as soon as he had it. Bruce would have no way to know he hadn't nabbed the whole sample. To push Doomsday into the next movie, an honest-to-god-Superman movie that might even let him have his usual active role in helping to form the Justice League, you have the chrysalis of Doomsday sink into the crust of the Earth after creation. The crash sites erupts with seismic activity, his dedicated statue in "Heroe's Park" swallowed up by the Earth, and our Big Blue hero is tasked nothing more than saving people at super-speed, perhaps debuting his freeze breath in stopping a flow of lava. Lex, never so careless as to be physically present but rather controlling the process through a remote hack, sets the Kryptonian ship to overload and detonate. Superman flies it into space, where it explodes invoking the scene of his nuking the The Dark Knight Returns. Superman Doomsday: Dawn of Justice contains several scenes of Superman saving people in full scenes complete with dialogue, giving people plenty of reasons to mourn him when he dies fighting Doomsday. It also provides a clear and present threat to give Batman a reason to scare up the other members of the Justice League as opposed to "just a feeling." It's fanfic, you don't have to tell me, we're at fanfic alert level MAUVE. I've unraveled the tapestry in trying to weave something of my own. And what I have here can be poked full of holes with little effort, I know it. But again, I have only been drawn to this process because I wanted more of Batman V Superman: Dawn of Justice, I wanted all the arcs and character beats it called upon to have room to breathe, instead of being delivered in its current rushed and hasty form. I have a lot of respect for scriptwriters, it's not an easy task. I'm sure the ones who worked on the movie we got could have done quite a bit more with the initial concept stage allowing for the creation of two movies, certainly giving us something better than what I have here... but also better than the movie we got.